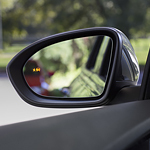 One advantage of one of the versions of blind spot monitors is that they let the driver know when there is something in their blind spot. That object or vehicle could cause you a lot of problems without the use of lights on the rear view mirrors. There are other features that let you know when you are in a dangerous place. One thing is dealing with the danger of collision when getting out of the parking spot and into traffic. Blind spot monitors and driver assist features are very helpful in this case.